Amazon's stock is up more than 60% this year to above $1,200 due to healthy sales -- and that's helped lift the net worth of CEO Jeff Bezos past the $100 billion level. Walmart's shares have soared 40% to a near record high of $100 thanks to robust growth in its online commerce operations. But the rest of retail? It's not exactly a happy Cyber Monday -- or year -- for traditional stores like Nordstrom, Target, Macy's, JCPenney and Sears. Shares of Nordstrom (JWN) have fallen nearly 15% so far in 2017. And that, perversely enough, makes them one of the better performers in the downtrodden retail sector. Target (TGT) shares have lost almost a quarter of their value. Macy's (M) stock has plunged more than 40%. JCPenney (JCP) and Sears (SHLD) are both down a whopping 60%. Why is Wall Street so confident that the retail battle is simply one between Amazon and Walmart? It's because both of them are growing increasingly dominant -- particularly in digital -- leaving the rest of retail to scramble for any scraps they can get. 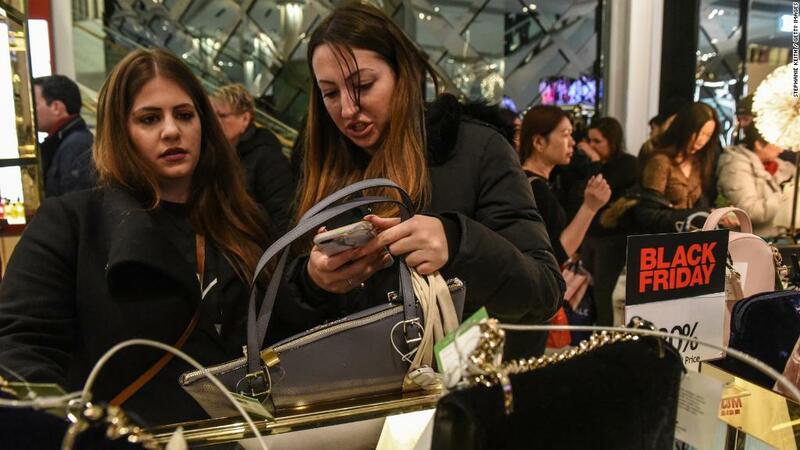 "The holiday shopping weekend was extraordinary for online retailers," said Sucharita Mulpuru-Kodali, an analyst with Forrester. Mulpuru-Kodali added she now thinks that e-commerce sales for the entire weekend, including Cyber Monday, will be up 16% from last year. She was originally expecting sales to be up 12%. And she said in an email to CNNMoney that "Amazon and Walmart seem to be benefiting quite a bit." Amazon (AMZN) is already the clear leader in online retail and it has stepped up its presence in the physical retail world thanks to its purchase of Whole Foods and opening of Amazon Books stores in many big cities. And Walmart (WMT) is becoming a bigger player in digital due to the purchases of Jet.com and specialty online retailers ModCloth, Bonobos and Moosejaw. Chuck Grom, an analyst with investment research firm Gordon Haskett, said in a report Monday that according to a survey of 1,000 individuals his firm did over the Thanksgiving weekend, Walmart and Amazon were the biggest winners. Gordon Haskett asked consumers which retailers they shopped at over the weekend -- both in-store and online. Walmart ranked well ahead of Macy's, JCPenney, Target, Sears/Kmart, Nordstrom, Dillard's and other department stores. And when looking at just the online component, Gordon Haskett found that consumers overwhelmingly chose Amazon and Walmart/Jet over Target's website as well as pure online retailers eBay and Overstock. "Wal-Mart (when combined with Jet.com) is not only a powerhouse among discount retailers, but in close competition with Amazon when measuring online traffic only," Grom wrote. More than three-quarters of those surveyed said they shopped at Walmart (online or at the store) over the Thanksgiving weekend and nearly 70% bought something at Amazon. The next closest retailer was Kohl's, with about 56% of consumers shopping there. And Kohl's (KSS), interestingly enough, has two partnerships with Amazon. Kohl's is selling Amazon hardware like the Alexa-enabled Echo, in some stores and is also letting consumers return and ship merchandise back to Amazon for free in several stores too. But is the retail world really going to remain a battle of just Amazon and Walmart? Not necessarily. There may be room for international online commerce companies and specialty online retailers to thrive. Christian Magoon, CEO of Amplify ETFs, an investment firm that runs the Amplify Online Retail ETF (IBUY), noted that Alibaba (BABA), the most significant online retailer in China, has done even better than Amazon this year. Its stock has more than doubled. Shares of Groupon (GRPN), Etsy (ETSY)and Canada's Shopify (SHOP) have surged too. "There is a ton of opportunity in online retail beyond Amazon and Walmart," Magoon said. But there may not be a ton of opportunity for traditional retailers finding themselves increasingly squeezed by Amazon and Walmart.